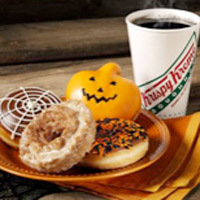 Krispy Kreme is making Halloween a little more sweet this year by offering FREE Halloween or Pumpkin Spice Doughnuts! All you have to do to get your FREE Doughnut wear a costume to a Krispy Kreme on Halloween. Don't forget to print your free coupon before you go! Bring your kids, friends, grandparents and significant others for this delicious deal! No purchase necessary!